up of archaeologists has discovered a life-sized marble head of Aphrodite while uncovering an ancient pool-side mosaic in southern Turkey. Buried under soil for hundreds of years, the goddess of love and beauty has some chipping on her nose and face. Researchers think her presence could shed light on the extent of the Roman Empire's wide cultural influence at the time of its peak. Archaeologists found the sculpture while working at a site called Antiochia ad Cragum (Antioch on the cliffs), on the Mediterranean coast. The researchers believe the region, which is dotted with hidden inlets and coves, would have been a haven for Cilician pirates — the same group who kidnapped Julius Caesar and held him for ransom around 75 B.C. But the pirates' reign ended when the Roman occupation of the area expanded. The city was officially established around the time of Emperor Nero and flourished during the height of the Roman Empire, researchers say. Past scholars have argued that southern Turkey's culture was too insular to be greatly impacted by Rome's reach and that it was a peripheral part of the empire. But the presence of an Aphrodite sculpture suggests Greek and Roman influence had become mainstream in far-flung cities like Antiochia ad Cragum in the first and second centuries A.D., the excavation's director Michael Hoff, an art historian at the University of Nebraska-Lincoln, said in a statement. Hoff said Aphrodite's head is the first fragment of a monumental statue they have found at Antiochia ad Cragum over eight years of digging. "We have niches where statues once were. We just didn't have any statues," Hoff said in a statement. "Finally, we have the head of a statue. It suggests something of how mainstream these people were who were living here, how much they were a part of the overall Greek and Roman traditions." 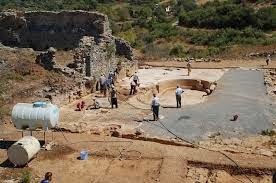 The researchers also found other traces of Roman influence, such as a second mosaic adorning a building that looks like it might be a temple. "Everything about it is telling us it's a temple, but we don't have much in the way of to whom it was dedicated," Hoff said in a statement. "We're still analyzing the finds. But the architecture suggests heavily that it was a temple."